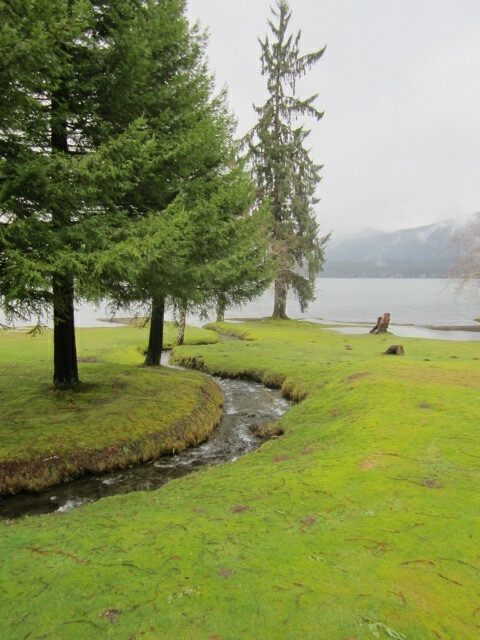 The Lake Quinault Rainforest was mossy and very green. 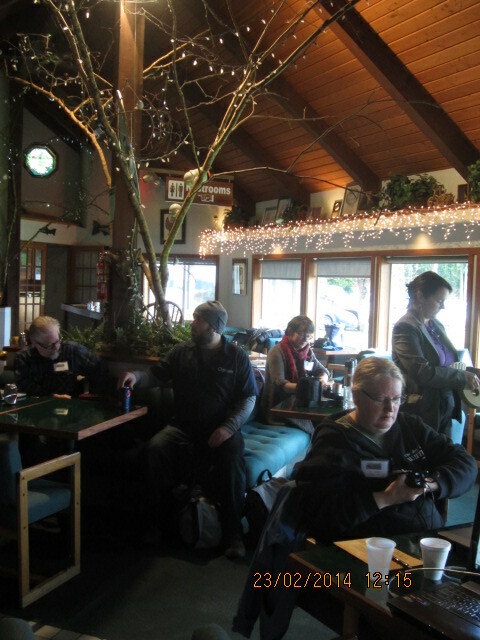 I just returned from five days at the Rainforest Writers Retreat in Lake Quinault, Washington. Lake Quinault is on the Olympic Peninsula, tucked away amongst trees, and why yes, a lake. 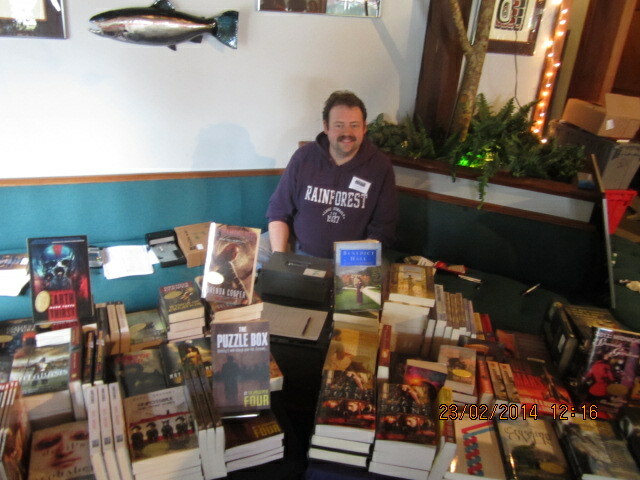 Patrick Swenson of Fairwood Press organizes these and does two a year, a week apart. I’ve been trying for three years to get in but it always sells out quickly. Last year, I finally got in but was on a waiting list (for about a half a day) because I had registered 24 hours later. Yes, it sells out that quickly and there are many alumni that return every year. As a “newbie” there were many things I didn’t know about the retreat structure but Patrick gives pointers on the website on what to bring, and near the time of the retreat we’re all on a yahoo list where we can ask many questions. I picked up another writer on my drive down from Canada and we did the leisurely, longer Pt. Townsend ferry route to the Lake Quinault Rain Forest Resort. Neither one of us having been before, nor secure in our direction sensing abilities, we did make one wrong turnoff, not to mention somehow taking that different route on Whidbey Island (I have driven there numerous times but it’s easy to take the wrong turn–still it’s an island so you eventually get to the same spot). We arrived Wednesday evening and got our rooms in the hotel. 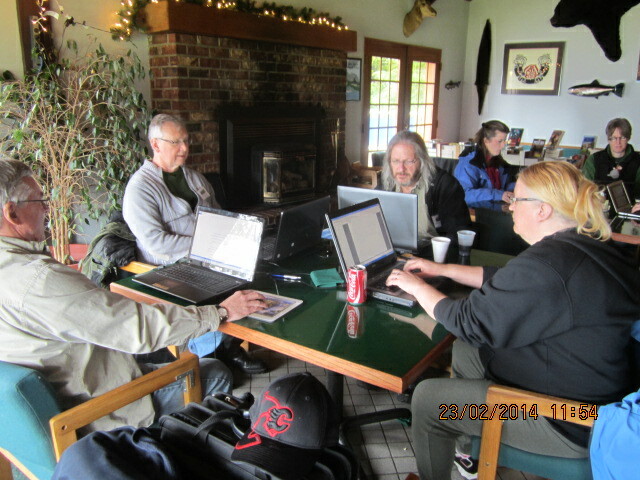 Writers writing in the lounge. The guy in red is writing by hand! The resort has cabins, cabins with fireplaces and motel rooms. I had no clue as to what was good or not so ended up in the motel room. The cabins are more costly. The rooms are fairly basic, sort of rustic woodsy toned. Mine had an odd smell and faced the back but the bed was comfy and I wasn’t in it much. I guess these ones get shut up more in the off season. The restaurant and lounge is where the writers congregate, and besides the lodge being open for dinner in the evenings, we had the run of the place night and day. Being off season, Patrick made special arrangements. Most breakfasts were included but lunch and dinner were on our own. There is “Cabin 6” where spare munchies, some sandwich makings and the word count board lived. The other good thing is there is a homemade soup and grilled cheese sandwich day in Cabin 6 and then we have a party on Saturday night. The Albertan contingent entrenched near the fireplace. Dead things decorate the walls. The word count board is where everyone writing lists how many words they’re creating. Some people go into the negatives if they’re revising. I was working on revising a novel so while I did add about 4,500 words I also got rid of some as well. The main thing is to write and everyone does it differently. You can go off to hide in your room or to Cabin 6 or you can stay in the lounge or dining room, in a group or by yourself, though others will filter in and out. I went to write and write I did. By the end of the weekend, the winner of the word count had written over 32,000 words, and between the 37-38 of us there we created over 300,000 words. That’s a trilogy right there. The bookstore is set up in the lounge, for writers or locals. Most of the people are at different pro levels though some are newer writers, but I’d say the majority were working on novels. There were several, optional one-hour discussions given by Nancy Kress, Louise Marley, Daryl Gregory, Randy Henderson, Jack Skillingstead and a panel discussion with Nancy, Jack, Daryl and Ted Kosmatka talking about outlining. Many of the discussions aren’t necessarily about things we writers don’t already know but it’s always good to chat about them, be reminded about them and hear how others do it. 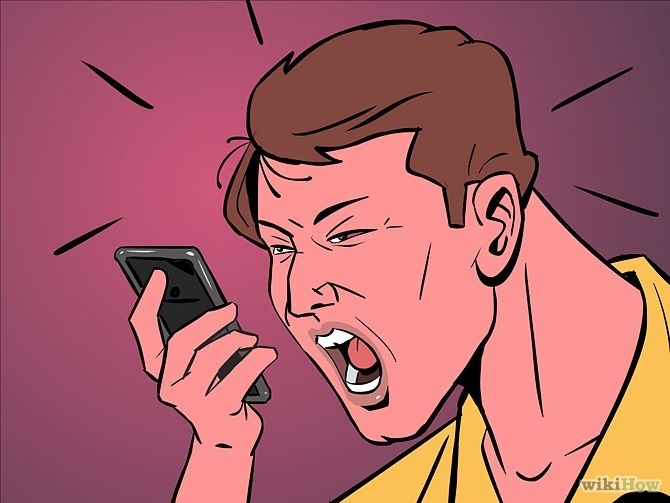 Outlining went from those who don’t even know how their book ends when they begin writing, to those who bullet point the details. 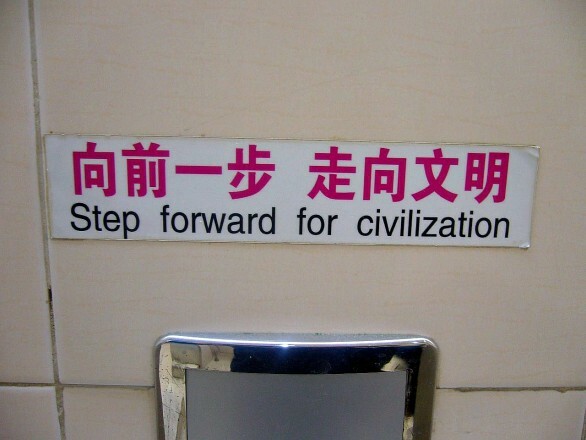 There is no right way, just many ways. It’s chilly enough to encourage people to write, but worth a walk to see some of the area. Rainforest Writers. Big sweaters, booze and laptops. As well, on Saturday night the University (of Washington) Bookstore sets up with books of all the writers present. It’s very evil and tempting and I’d wished I had more money. Writing, perhaps of all the arts is probably one of the most solitary. We sit alone at our desks and write. 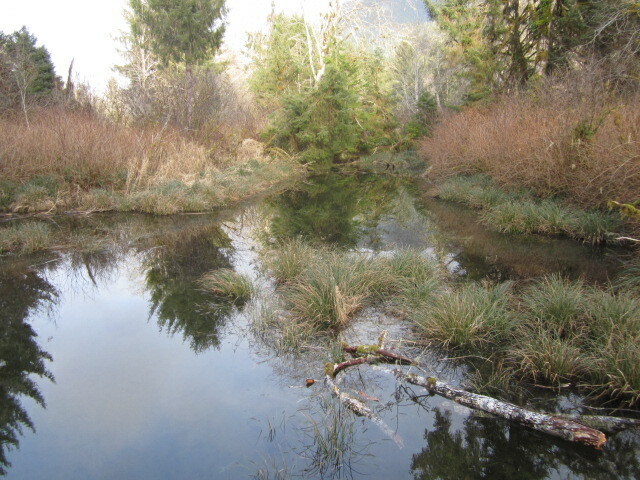 At the Rainforest Retreat, there was the lovely (if chilly and cold–it IS February) rainforest to explore that also has the world’s largest Sitka Spruce. It didn’t look that big until you walked up to it and realized you could put six people up on its trunk. There’s a store that sells various items including Sasquatch poop. 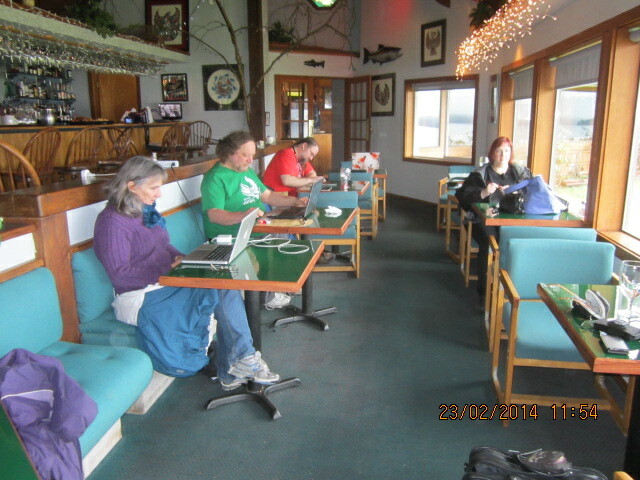 We also sat quietly typing away or taking a break and talking with others. But it was actually really nice to look up and just see others doing the same thing; a camaraderie of our group writing solitary together. 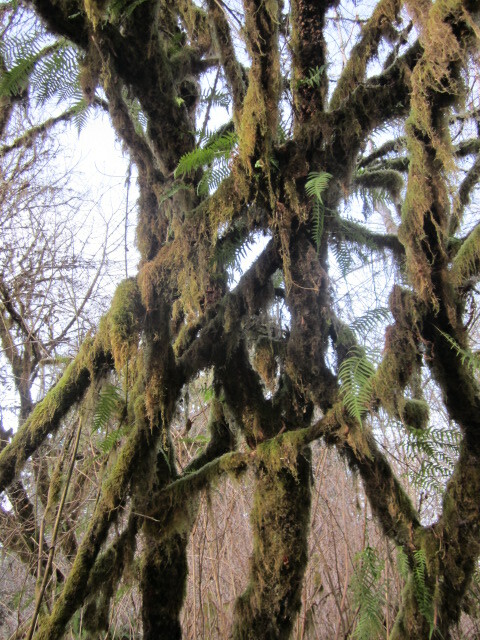 The land of super mossy trees. The setting was inspiring for writing. I made it through 50,000 words of revision on my novel, fixing some things as I went, that I’d woken up to through the talks. I got to know some of the writers a little better, and everyone would take a moment at some point to geek out and talk about “their story.” It was thoroughly inspiring, productive and fun. I’m not sure if I’ll do the retreat next year but like the group that comes out from Alberta every year, it could very well become an annual pilgrimage. I won’t mention that I drove home through an unexpected snow storm, with the heater not working in my car and how I had to stay in Bellingham the night. No, I won’t mention that because I had a great time even if I was a popsicle by the time I got home.